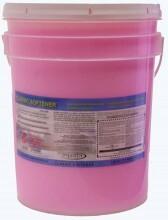 The Classic Softener is a highly concentrated laundry formula designed to reduce wrinkling, soften fabrics and leave laundry static free with a very pleasant neutral fragrance.This product is used for all types of materials including cotton, wool & Polyester. Can be used as an alternative to the Classic Stage 4 detergent. Click to view SDS and MSDS Sheet.